Nelipak design and supply a range of cleanroom manufactured pouch packaging solutions to suit your medical and pharmaceutical packaging requirements. Part of Nelipak’s turnkey packaging solution, pouch packaging is designed to work with Nelipak thermoformed medical device trays and blisters. 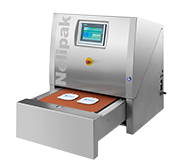 When combined with our trays, lids and tray sealer solutions, Nelipak provides a total packaging system solution from one trusted supplier. Our team of packaging experts have been designing sterile packaging products for many years and can provide detailed guidance on the suitability of materials for each sterilization process together with validations to suit your products requirements.